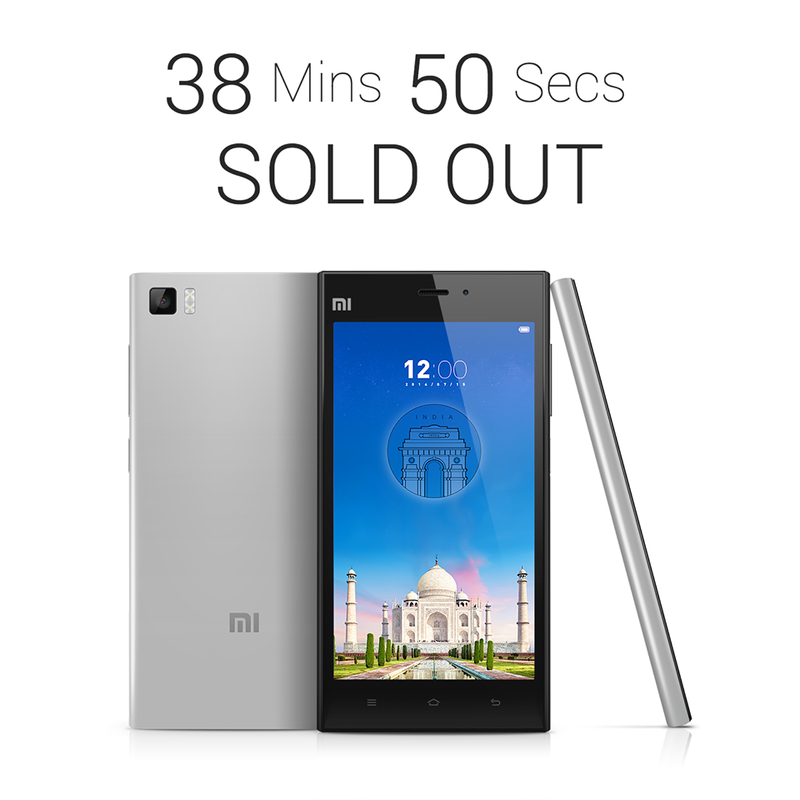 The third flash sale of the Xiaomi Mi 3 smartphone was over in just two seconds on August 5, the Chinese handset maker posted on its Facebook page. Xiaomi had earlier revealed its plan to sell 15,000 units of the Mi 3 on e-commerce website Flipkart at 2 p.m on Tuesday. The story has been no different since the launch of the Xiaomi Mi 3 phone. It went on sale on July 22, and the company had claimed to receive around 1,00,000 registrations by July 21 itself. Only registered users could buy the device the next day. However, pre-registration didn’t guarantee you a unit, and it only meant you were eligible to buy the phone. As soon as the Mi 3 went live on the site, Flipkart couldn’t handle the traffic and the site crashed temporarily. Within 40 minutes, Flipkart claimed the Mi 3 was out of stock, but the site promptly said it would bring in the next batch on July 29 while the registration would begin on July 28. For the second sale, Xiaomi had asked customers to log on to the website and stay ready for the sale. 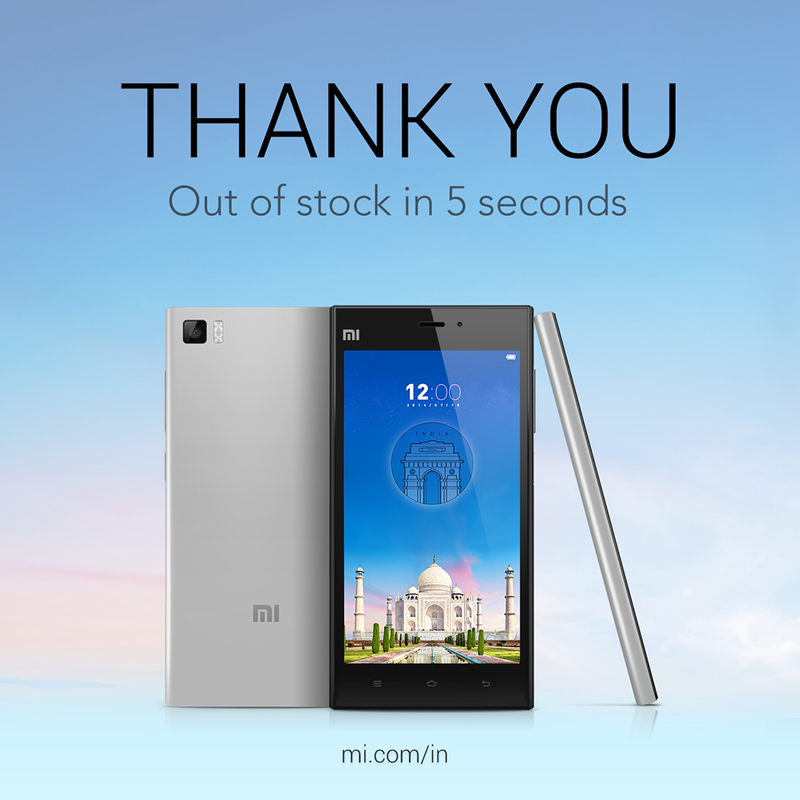 Xiaomi sold out all Mi 3 devices in its second flash sale online in five seconds. There were an estimated 2.5 lakh customers on the site at the time of the sale on Xiaomi’s Mi Phone Site. Flipkart, the sole seller of Xiaomi phones in India, said the traffic load at 2 pm on Tuesday afternoon when the sale began, was 4 times higher than the heaviest level ever experienced by Flipkart’s infrastructure. There is no doubt that Xiaomi's Mi Phone have created huge euphoria in the market and people now want to posses the phone to flaunt it to others who have been unable to get a hand on it yet. But its also worth appreciating that the phone is getting good reviews too. Value for money: With a price tag of Rs 13,999 and a Snapdragon 800 on board, this is by far the cheapest high-end phone in the market, making it competition for the likes of Nexus 5, Galaxy S4, Xperia Z at nearly half the price. Build Quality: The Mi 3 looks sturdily built using a magnesium alloy frame coated in thermal graphite film. In addition, Xiaomi claims 120 laser-cut cutouts for the speaker grille and a metal-reinforced USB port. In fact, it’s distinctly better looking than any other offering at this price point, including the Moto G, which we believe has the best build quality in the mid-range segment. UI Advantage: It Offers a highly differentiated UI experience in comparison to offerings of Indian brands which offer a version of stock Android with some minor changes to the UI which is not as well differentiated as MIUI. MIUI also has a huge development community and lots of resources and tools that make it a veritable contender against TouchWiz and Sense. Could this massive enthusiasm turn into anger? While many registered users were able to add the phone to the cart, there were others who complained about an error appearing on Flipkart or the webpage failing to load. Many users posted on the Mi India official page that the phone was added to the cart and they were asked to make the payment next. However, for some users, Flipkart showed that the phone was added to the cart but there wasn't anything and were asked to return in 15 minutes as the phone was blocked. There are many angry users on Facebook who were unhappy with Xiaomi's strategy as they were not able to buy the device. Well the next sale of the Mi 3 will be on August 12 and registrations for the same began on Aug 5, 6 pm itself. It will be interesting to see how long does Xiaomi carries forward with the flash sale strategy of Mi 3 phones and how long can it retain the user interest.